Did you know Daylight Saving Time was originally created to move us toward “summer time” so we could make better use of the sunlight hours? While turning the clock ahead an hour may give you a little extra light in your day, it’s also been known to wreak havoc on people’s schedules — especially of families with children under the age of two. Do nothing. Keep bedtime the same. Put your child to sleep at the regular bedtime. Then, go ahead and move your clock one hour ahead. Hopefully your child’s body clock is already set so if they normally wake at 6am in the morning, now it will be 7am on the new time. This can really work in your favor. And then on Sunday, continue your regular routine on the new time. At bedtime put your child down at their normal bedtime so if your child normally use to have a 7pm bedtime they might not be as tired because it’s actually 6pm on the old time. Again, our children don’t understand time and clocks and how all of this works. So be patient and flexible. You might even consider using the shuffle or other gentle sleep methods to help your baby or toddler fall asleep. 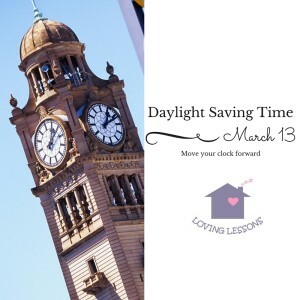 The good news is that if you have an early riser, Daylight Saving Time may help you resolve this issue and it usually takes a little less than week to transition with this approach. This method can be helpful if your child has a little more difficulty or is sensitive to transitions. Start this approach about a week before the official time change in order for him to already be in his new sleep habits by the seventh day. For example: If his bedtime is normally 7pm, shift it to 6:30 (which will be 7:30 after the time change). This will help ease him into his new bedtime since his schedule isn’t being thrown off by an entire hour. 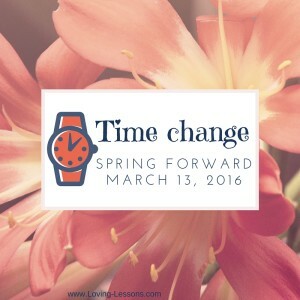 After springing forward you‘ll need to adjust when he takes his naps and eats his meals as well. For instance, if your child is used to going down for his afternoon nap at 1:00, put him down at 1:30pm while making the transition. The goal with either of these approaches is to get your child back to his or her regular bedtime as effortlessly and as quickly as possible. Keep in mind, too, that either processes usually take five to seven days to even itself out. Get at least 30 minutes of fresh air and sunlight first thing in the morning. This can help the body adjust to the time change and is also known to help improve the quality of your sleep. Encourage your child to get plenty of sleep during the day so she won’t become overtired and have trouble falling asleep at night. Remember: you are your child’s best expert so you get to decide what’s the best and healthiest way to make springing forward an easy transition for you and your family. 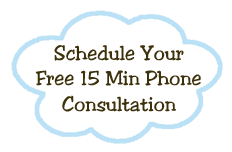 Do you have sleep questions or concerns for your 6-year old or younger child? 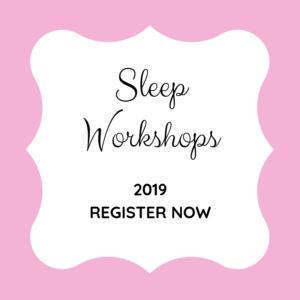 Feel free to pick a time on my calendar for us to talk about all the different ways you can help get sleep in your home gently!